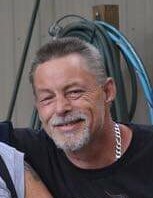 Mr. Edgar “Eddie” James Mason, 52, died Thursday November 22, 2018 at his home. He is preceded in death by his mother, Dolores Clay and brother, Beau Conley. He is survived by his father, Edgar James Mason, Sr. and stepmother Marie of New Jersey; children: Josephina Iiga, Jerriecha Balajadia, Miekie Iiga, Edgar James Mason III, Taumuli Mason, Fa-Afounia Mason, Evan James Mason, Luke Taylor Mason and Rosalie June Mason; 10 grandchildren; three significant others, Temukisa Iiga (1989-2000), Danielle Lee (2001-2014), and Lisa Brown (2017-present); sisters Rose Mason of Ogden, UT, Alicia, Tammy, and Sherry of New Jersey; brothers Kevin, Brian, and Joey of Fayetteville. A memorial service will be held Friday, 1 P.M. at Freedom Biker Church.